we made a flexible ruler for dm, Berthold points, Pica points, Didot points, DTP Cicero and other units that you can change easily for your own needs just in seconds. Even if you need furlong, light-nanoseconds, Fournier point … no problem. Now you can have many rulers with different units at the same time. And they even can measure curves. Some backgrounds can be found somewhere. Have fun and help to improve Affinity apps. This is really very useful. I tried out the UPD version, but it seems the cm+mm ruler doesn't work, the others do. Perhaps I'm using it wrong. Could you post a short how-to ?? Thanks again, excellent work ! That one is a group. You can use the “Vector Crop Tool” to make it bigger/longer or smaller/shorter or just ungroup it. Or use the “Text Tool” (and copy & paste) to change the lenght or the form and colours of the divisions/strokes and digits. Use “Underline” or “Strikethrough” if you need lines. Hopefully Serif will create the best rulers (with two scales, …) on earth. Please before we have gone. Oval, you Legend! Super useful!!! I think that Pica need to be a ruler unit in Designer and Publisher. 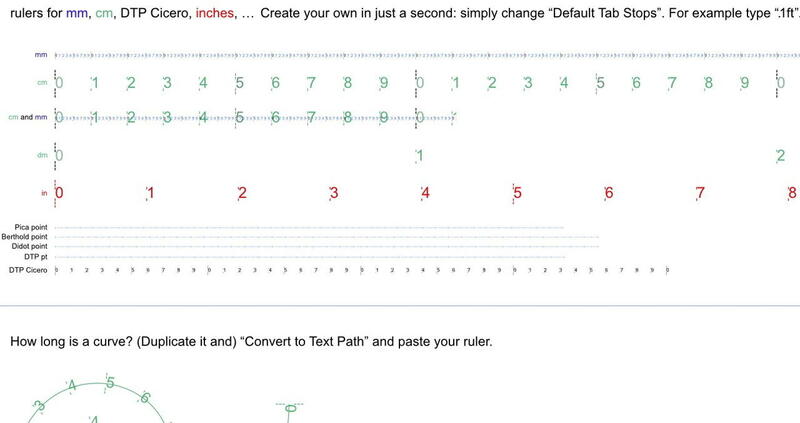 Please can you clarify one thing about this attachment (currently intelligent_rulers_upd2.afdesign)? The line called "DTP Cicero" is surely "DTP Pica", being 6 units per (English) Inch. [This is standard "Postscript Pica" not American Pica or French Pica .] "Cicero" is, as far as I know, always defined in terms of the larger french Royal inch, or is "DTP Cicero" a term I have not come across meaning the same as "Pica"? Furthermore, Do people still use use the [French Royal ] 'Cicero' and Didot ? That customer in the other thread seems to want to claim something back for France, but is it common? Indeed, should we adopt other ruler units like the CSS standard Q point 1/4 of a millimetre? Cicero and Didot (or Didot point) are in my opinion less useful than Picas, but could be included, if so what else. NOTE: We used to have both Cicero and Didot in DrawPlus rulers, but looking at the code right now DrawPlus used an incorrect value for Ciceros of 4.5363 mm and defined Didot in terms of 1/12 of a Cicero, so 0.378 mm. Neither of those numbers is correct and no customer ever told us they are wrong in the 10+ years they were in various releases of DrawPlus ......! -- which is 1/6 of a French Royal Inch (and 12 Didot Points). -- which is 1/72 of a French Royal. Does anyone disagree or have an opinion on rulers they themselves want? DTP was used just to ensure that (not the old Didot point but) the “actual” unit is meant. Experts see at a glance: 1(0) DTP Cicero = 12(0) DTP points (compare the last two rulers).